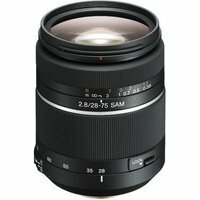 The Sony 28-75mm F2.8 SAM lens is a high quality, wide aperture zoom lens covering a versatile range of focal lengths from wide angle to medium telephoto for general purpose shooting. It provides superb results with Digital SLR cameras using full-frame sensor and its Smooth Autofocus Motor (SAM) makes AF operation quick and quiet. Construction is made up of 14 elements in 16 groups, including four aspherical elements to ensure superb image quality.